Chancellor Hammond told roughly 330 business leaders in the call that government plans to avoid a hard Brexit had been "properly drafted" and could be successful, according to the transcript. Conservative minister Nick Boles had allegedly proposed the idea, with Chancellor Hammond saying the government could extend Article 50 following cross-party talks on UK prime minister Theresa May's rejected Brexit deal, the transcript stated. Three Tory MPs — Mr. Boles, Oliver Letwin and Nicky Morgan — tabled a bill to allow Parliament to extend Article 50 should the Government be unable to present an alternative Brexit plan. "My judgement is that there is a significant majority in the House of Commons against no deal," Mr. Hammond said in response to Tesco's CEO, who asked if the UK government would "frustrate the progress" of the proposed bid. Mr. Hammond also said that the Government should form a consensus across Commons on how to plan a contingency, adding that the Cabinet could "go back to the EU to agree changes that are necessary to deliver that consensus," if necessary. "And at that time, if more time is going to be required, to negotiate that with the EU." What Has the Cabinet Said So Far? Business secretary Greg Clark also sat in on the call with Mr. Barclay, who spoke with firms including BP, Co-operative Group, Amazon UK, Tesco and others, and said that the next few days would help the Government to "reflect all of the things" that business leaders had reported. He added that the Government must also strike a deal with the EU that maintains "as close a trading relationship with the rest of the EU" as written in the negotiated agreement. "That is vital," he said. He also said that the Government should "come to a conclusion quickly", adding that "this can't go on much longer. "A lot of people had made prior commitments," Mr. Clark continued. "But there is a very clear majority in the house not to have no deal, to have a relationship with the EU that will allow you to trade and prosper in future, and to bring this to a conclusion quickly." While Hammond and Clark talked about taking no-deal 'off the table', Stephen Barclay warned that doing so would 'weaken' Govt negotiating hand. Approach left business leaders confused. Head of Tesco said there was an 'inconsistency' between their positions. Many businesses are venting their frustrations over Brexit, with Balfour Beatty CEO Leo Quinn demanding a return to a "normal, functioning government". "What we are seeing from industry is decisions are being delayed, we are seeing strategies not being confirmed," Mr. Quinn said. "Within the construction industry for example the future of HS2 is unclear, Heathrow confirmation that expansion plans will move forward — none of these are under our control." 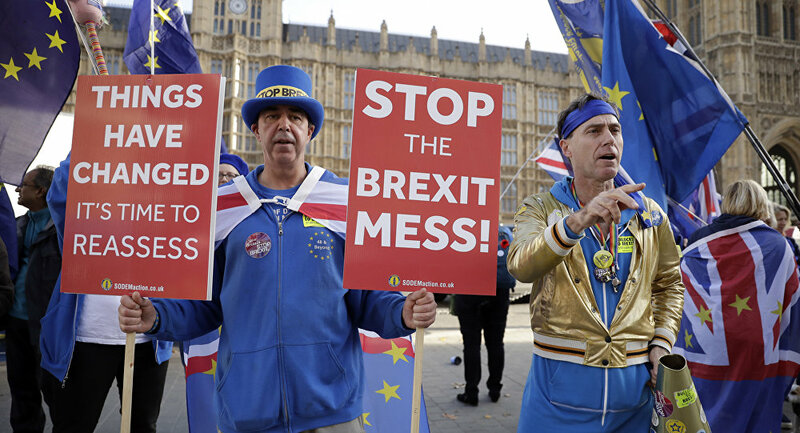 Business across the UK have been scrambling to reorder their operations following Mrs. May's failed Brexit deal, which was voted down 432-202 in Commons on Tuesday evening. Businesses such as Jaguar Land Rover, BMW and others have cited fears of a no-deal Brexit and looming economic recession, and have planned their own contingencies, including spreading operations across European Union finance and production hubs such as France, Germany, and even Eastern Europe.